Physical Keys to Digital Memories: Reflecting on the Role of Tangible Artefacts in "Reminisce"
This paper will discuss the role that tangible artefacts in the context of an interactive installation have as mediators between the physical experience of an open-air museum and the layer of digital information that is available to visitors about the site. We refer to the case study of an installation – Reminisce – designed for an Irish open-air museum, Bunratty Folk Park, where participants could follow trails around the site on the footsteps of characters from Ireland's past. At different historic houses, visitors could collect ‘tokens’ related to the characters both in digital and physical form: audio recordings of personal memories downloaded to a smart phone application, and physical objects representing aspects of the characters' lives. We discuss the role that the tangible artefacts had in bridging the digital and physical spaces of the installation, as well as extracting recommendations for designing installations in living history sites. Open-air museums (also known as ‘living history’ museums) are popular visitor attractions worldwide. They retain many of the qualities of traditional museums (that are organised in room-sized exhibits) but also present different challenges, such as their out-of-doors nature, the different physical path and time frame of the visit, the importance of location and of movement between different buildings and corners of the landscape. These features make interesting challenges when thinking of the role that technology could have in such settings. Place-making and dwelling are also important aspects of the visit to an open-air museum as these sites exhibit buildings and man-made landscapes that can be inhabited by the visitors, who can also relate to the original inhabitants and their way of life in that environment. Moreover, the individual objects are displayed in a richer context (compared to the ‘standard’ exhibit case in a gallery which is by its own nature displaced from its original and/or appropriate context), making the connection between lived place experience and artefacts on display more evident than what can be achieved in self-contained exhibits. Therefore, open-air museums are also essentially ‘interactive’ in the sense that they do not display static content and that the visitor experience is sensorily and physically involving: as well as perceiving artefacts in a more rounded and ‘live’ way, they participate in activities, see staff demonstrations, and sometimes touch, explore and participate in the exhibits. Technology has made its way to open-air museums, although not at the levels witnessed in other cultural heritage institutions. Mobile technology is one of the solutions that have been employed in these settings. The majority of research on the use of portable devices still refers to indoor exhibition sites (see, for example, Aoki et al. 2001), and recently deals with the use of visitors’ own mobile phones in these settings (Samis, 2007). However, some relevant work has been conducted with respect to outdoor visitor experiences, such as field trails in cities or at other heritage sites, as well as open-air museums proper. For example, the Frilandsmuseet open-air museum at Lyngby (Denmark) ( http://www.natmus.dk/sw20384.asp) has deployed mobile phone-based trails guided by fictional characters connected to the setting of the museum. These trails are targeted at teenagers and have the goal of involving them in learning about the holdings of the museum in a way that is closer to their personal experience: the fictional characters are also teenagers and the participants are invited to make comparisons between their own lives and those of the characters from the past (Ruhe, 2010). Other recent endeavours have also focused on the use of smart phones in support of outdoor visitor trails. Paterson et al. (2010) have developed a game-trail for the City of Dublin: Viking Ghost Hunt, based on GPS technology, offering players the overlay of a playful ‘theme’ for their visit to the city centre. Another example is the Culloden Battlefield visiting aid (Pfeifer et al., 2009), which was developed with the goal of making GPS guide tools a commercial success, offering little in the way of reflection over user needs and design process. The ‘visit as game’ scenario is not the only one to have been explored. Another significant area to have been researched is that of the social dimension of the visit, and of the sharing of individual experiences to some extent. In their paper describing mobile shared visitor experiences at London Zoo, O’Hara et Al. (2007) discuss aspects of bookmarking and socially sharing relevant ‘milestones’ during the visit, arguing how incorporating the social aspect in the design of a personal device helps foster engagement with the site. Collaboration was also inscribed in the design of city games (for example, Brown et al., 2005) that had the goal not of guiding participants, but rather of extending their experience of a city with an added layer of engagement. Giaccardi and Palen (2008) reflect on the role of cross-media interaction in the experience of a community project where participants overlaid their physical journeys in an area with sound ‘snapshots’ for reflection and sharing. Similarly, Walker (2007) discusses social sharing of the visit in MyArt Space, whereby tagged objects that participants selected in their visit to several museums become a personalised history of the visit. It is important to keep in mind that certain limitations of mobile technology as support to the visit have been highlighted in previous research - mainly isolation and detachment from the setting - and that these could be overcome by innovative design. Mobile devices alone might cause people to detach themselves from the exhibits, and often the mobile content provided is disconnected from those sensory qualities of a place that are so engaging to visitors. Open-air museums offer an interesting environment for the consideration of how mobile personal devices could be used in synergy with other elements to provide a more seamless visitor experience: in other words, not have visitors concentrate only on the high-tech device, but keep their focus on the site itself. Open-air museums are also ideal sites to experiment with user participation, building on the interaction with animators, the experience of ‘inhabiting’ the exhibit, and the multi-sensory aspect of the visit - sometimes lacking in other settings. Our research differs from other work both on the explicit focus on understanding the situated experience at an open-air museum for the purpose of design, and on the attention towards participatory elements that engage visitors. We feel that current technology should be merged and coupled with tangible artefacts and physical elements, in order to provide more engaging experiences and overcome some of the limitation of mobile installations. In the following sections we present our project, Reminisce: we describe the site we examined and the installation that we created for it, highlighting how tangible artefacts were incorporated into its design, and what role they had in the development process as well as in the visitor experience. Bunratty Folk Park is situated on a 26-acre site in County Clare (Ireland). It is an extremely popular tourist attraction and one of the most visited heritage sites in Ireland. The majority of visitors are either Irish or of Irish descent, with Irish-American visitors being the most numerous group. Bunratty Folk Park is comprised of 32 historic dwellings that have been relocated there from different regions of Ireland and furnished appropriately to the period and context. The Folk Park also features hands-on activities, landscapes (such as Georgian-style formal gardens, wooded areas, farmland and domestic gardens) and livestock from wild deer to farmyard animals. A number of human animators are the most significant ‘interface’ between the museum and its visitors: printed information on the site is limited and offers only spatial guidance; therefore the animators are the most important source of information for visitors. The most significant group of animators are the Bean An Tí (Irish for “Women of the House”), who are in charge of the upkeep of some of the farmhouses, of baking bread and cakes for the Park’s tearoom, tending the turf fires and demonstrating traditional activities such as butter-making and baking. Although visitors greatly enjoy the interaction with the Bean An Tí, it can be difficult for these animators to manage high visitor flow, due to the many duties they have. In the Winter months, when the Folk Park is quieter, the number of animators is also smaller; therefore their average workload remains high throughout the year. The design process leading to the deployment of Reminisce began with extensive qualitative studies of the site (Ciolfi, McLoughlin & Bannon, 2008), and subsequently included hands-on scenario development workshops, prototyping sessions and feedback sessions featuring some of the Folk Park staff members (for a full account of the design process, see Ciolfi and McLoughlin, 2010). Something that was clear from early on during our studies is the importance of the physical, tangible qualities of the experience at Bunratty Folk Park in keeping visitors engaged, interested and active: smelling the turf fires and the freshly made butter, tasting the freshly baked bread, touching the buildings and petting the animals are activities that people enjoy, talk about and seek actively during their visit. This is one of the reasons why novel technology on site could become a distraction and pose some problems also from other points of view: how to seamlessly fit in with an atmosphere of authenticity and character? How to provide added value without taking away from the existing positive qualities of the visit? How not to lead visitors to detachment from the site in favour of technology? How to maintain and foster sociality? However, novel technology, if carefully designed and introduced, can also bring benefits: it can help provide entertainment and personalized information when staff members are busy or thin on the ground, provide greater information for visitors, and encourage their active participation in and appreciation of what they see. In our final design, and particularly in order to keep a sensory and tangible link with the site, we explicitly provided physical artefacts to play a role in the interactive installation: we included physical objects related to some of the farmhouses at Bunratty Folk Park as essential components of the interactive experience of Reminisce. The theme of Reminisce was that of memories and recollections inspired by the buildings in the Folk Park, and the goal was to bring a layer of personal content that would add to the site in terms of lived experience and personalisation. Fictional characters were created for visitors to follow around the site and hear reminiscences from them about their past lives at particular houses. This theme is a common one in designing visitor trails for museums. Reminisce, however, presented some novel characteristics: the use of tangible ‘tokens’ for controlling parts of the installation, and the capability of the system to take visitors’ contributions in real time in the form of audio recordings. Memories were marked by QR codes placed at different locations around the Folk Park; visitors could access them by scanning the codes with a mobile phone (Figure 1). The codes would trigger an audio recording of a chosen character’s memory at that site, to be played on the handset. Participants were also able to record their own thoughts in real time at these locations, adding a layer of personal information to that collected during the trail. The tangible tokens took the form of small packs of keepsakes (see Figures 2 and 3), each containing a physical souvenir that participants could bring home with them after the visit and that was associated with each site: for example, the turf could be found in the Shannon Farmhouse where turf fires would always be burning, and different recipes at houses where baking demonstrations normally take place. The keepsakes included traditional recipes, pieces of turf, small hanks of wool, etc., with different objects available at different houses. The tangible tokens provided clues about where the participants could find other memories in the trail, but as well as this, they provided the key to access yet another interactive component of Reminisce, the interactive desk in the Folk Park’s schoolhouse, the last site of the trail: the clues were printed on cards with RFID tags embedded in them. 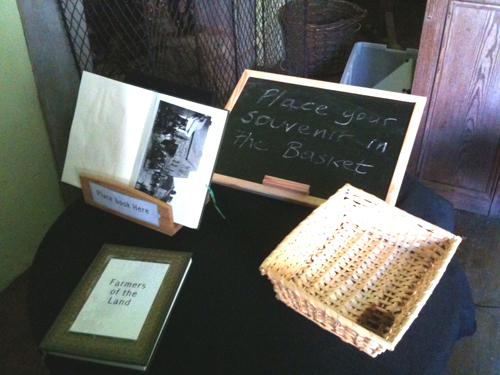 When they reached the schoolhouse, the last site on the “Reminisce” trail, participants could use the tangible tokens as input devices (Figure 4). In the schoolhouse, the interactive desk allowed people to listen to recordings that other visitors had left at the sites in the trail. Placed on the desk were books with embedded RFID tags, each of them relating to one of the characters that visitors could collect memories from. A book holder and a basket with embedded RFID readers were also placed on the desk. When one of the books was placed on the holder and one of the tangible tokens was placed inside the basket, the recordings left by other visitors were played back. These recordings were of the site where the tangible token was collected. To provide participants with a memento of their visit: the visitors would receive a simple keepsake which was, however, connected with the complex experience of the site, reminding them of what they had encountered in the Folk Park, both digital and physical. The tokens were also mementoes of Reminisce itself and provided the experience with an element of tangible simplicity and straightforwardness that technology can sometime lack. To guide participants to other memories available to them: having clues in the form of a physical object was a way of not letting the technology take over the entire storyline of Reminisce and grab all the visitors’ attention. The participants had to use a mobile phone for the collection and recording of memories; therefore, we wanted to introduce a low-tech way of finding clues and connecting the houses to each other. The physical tokens provided clues in the context of the houses, encouraging visitors to consider their surroundings - and not only the technology - when progressing in their exploration. Having physical clues that were present in the different houses was also a way for those visitors not participating in Reminisce to come in contact with it somehow, and to become interested in the installation. To allow participants access to the memories that other people left at the site: the tangible tokens did contain a hidden high-tech element, the RFID tags, that was the key to interacting with the installation in the schoolhouse. The interactive desk looked very low-tech, in keeping with the surroundings, but provided a way to access the ‘cloud’ of digital content created in real time by the participants. Reminisce was deployed in Bunratty Folk Park in August, 2010 and tested over three full days. During this time, approximately one hundred people used the system in different degrees (e.g. from taking a full tour, to a partial one, to using some of the individual components at the different sites). Due to its exploratory nature, visitors could try the installation free of charge, and all the accompanying materials were also provided. We collected data regarding the participants’ experiences of Reminisce through observations, shadowing, and informal interviews. At least three people from our team were always present on site to facilitate the participants and to monitor the equipment. In the following section, we present some examples of the visitor experience of Reminisce, highlighting the role that the tangible tokens had in bridging the digital and physical aspects of the trail. From these examples, we draw insights and recommendations for other designers and for museum professionals regarding the opportunities and challenges of a hybrid physical/digital installation. Reminisce provided the visitors to Bunratty Folk Park with a unique experience: different from other systems designed for outdoor sites, it mixed a variety of components to maintain a link both to the physical, perceptual qualities of what is on display and to the wealth of digital information that can enrich the visit. Related work has shown how the combined presence of tangible artefacts and of a digital layer of information overlaid on to physical artefacts is effective in sustaining visitor engagement at exhibition sites (Fraser et al., 2003; Koleva et al., 2009). At Bunratty Folk Park, the added value was in the design focus on the lived nature of the place: all the elements of Reminisce, and particularly the tangible tokens, presented material, cultural and social connections with the environment, from the content they provided, to the shape and material quality they took, to the ability to encourage social interaction and sharing on the nature of the Folk Park. Moreover, the installation allowed for a high degree of personalisation in each component: the phone enabled participants to create their own content at well as access the memories from their character of choice, and the two activities were coupled in order to suggest to visitors that their contributions were as important in the ecology of the installation as the previously prepared content. The tangible tokens were given to visitors as personal souvenirs that all participants happily took home afterwards and used often during the trail as a tangible ‘trigger’ to conversations and discussion with companions and other visitors. The interactive desk in the schoolhouse introduced a further shared element into the visit by linking the individual tokens with contributions from other participants. Finally, a Web resource gave visitors a way of reviewing their unique trail in the Folk Park, providing them with an overview of their journey as well as with the entire set of memories generated in their visit, accessible after leaving Bunratty. The tangible tokens were designed as elements for piecing together the overall activity around Reminisce, based on a storyline focused on material culture, personal objects, and personalized content to bring the houses in the Folk Park to life. Example A in Figure 5 shows how the tangible artefacts worked as connectors from one house to another through the clues they provided. In this example we see a family group composed of Grandmother, Breda, her Daughter-in-Law Sharon, and Seamus and Angela, Breda’s grandchildren, in the Loop Head house. Example A shows how the tangible tokens provided visitors with a physical ‘anchoring’ to the houses. The artefacts are on site, closely connected with what visitors are experiencing in the house, an indication of progress in the trail (they correctly identify the Mountain Farmhouse in the map), and a tangible representation of progress along the trail: the more tokens you have, the more memories you have collected and shared. 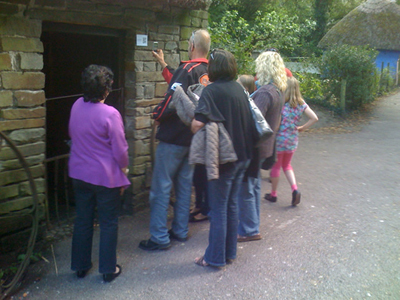 Verbal feedback from participants collected through informal interviews also confirmed their appreciation for the multisensory link that the tokens provided: introducing as part of the installation something that visitors could touch and even smell (such as the turf), made the Reminisce trail feel much more organic to the Folk Park surroundings. Participants commented often on how interested friends and family at home would be when they showed them the objects. Interestingly, the clue packs also seemed to provide participants with ways of linking their visit to Bunratty with activities to be undertaken at home. In Example B (Figure 6), we see the family in the Golden Vale farmhouses, where cooking and baking are often demonstrated by the Bean An Tí. 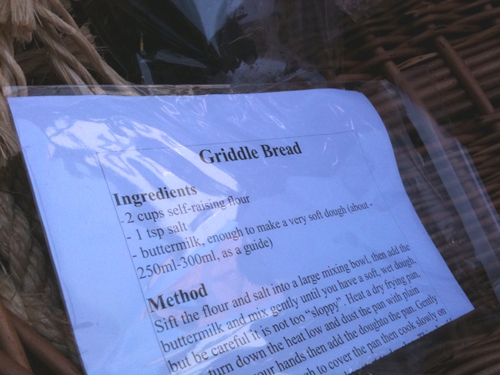 The clue pack contains a recipe for a traditional cake that both Breda and Sharon recognize from their own domestic life. The recipe is something that should be kept and brought home so that Angela can try to make the cake which both her mother and grandmother know well. The tangible object will provide a memento of the visit as well as an opportunity for a new activity when the family returns home. The pack containing a small piece of turf was one that participants from abroad commented on the most, and that they wished to bring back home as a keepsake to show family members what turf looks and smells like. As we have described earlier, another function of the tangible tokens was to allow full interaction with the interactive desk in the schoolhouse. The tokens worked as ‘keys’ to unlock further digital content connected to a specific site. In Example C (Figure 7), we see Anna, a German visitor, using the tokens that she has collected in her trail around the Folk Park to operate the desk. She places the book regarding the ‘Farmer of the Land’ character on the book holder, and a token into the basket. Anna operates the desk easily, and immediately connects the content she hears in the recordings with the Mountain Farmhouse. She proceeds to listen to more participants’ recordings at the desk. All visitors had no problem grasping the functionality of the interactive desk, and all were able to understand the connection between the content and the sites on the trail. The interaction with the desk was also something that onlookers noticed with curiosity and interest: many stopped to ask the Reminisce participants about the installation, others to listen to the recordings as they were played back aloud. The Folk Park animator who impersonates the Teacher asked for a set of tangible tokens that he could keep with him in the schoolhouse, so that he could use the tokens, the desk and the content associated with it as part of his usual interaction with the visitors. This was an interesting use of one of the components of Reminisce, and also showed that a tangible interaction device can be flexibly used in the context of the Folk Park to make additional content available for discussion and even to aid staff members during busy periods. We present one final example, showing how the tangible artefacts worked as a trigger for social interaction in the schoolhouse. We already saw in Examples A and B (Figures 5 and 6) how the tangible tokens led to discussions and conversations among groups of participants at the different houses. In Example D (Figure 8), we see Emma and John, a married couple, using the tokens at the interactive desk. The content triggered by the tokens sparks discussion between Emma and John, but also makes them somehow connect with other visitors, in particular the person who recorded the comment about how cold it was in the house. Emma and John recognize that she is talking about the Mountain Farmhouse and pay attention to her remark about the cold, as much as they had commented about the previous story about the wedding dress. These two instances show how a link is established between the current users and other participants involved in Reminisce. This link is certainly realised by the combination of the tangible ‘keys’ and the content generated by visitors themselves during the trail. It does show however that the simple, physical interaction style around the desk ensures that the visitors’ attention is firmly on the content of the installation. The four examples presented in the previous section are just quick snapshots of the interactions that occurred around Reminisce, in particular, involving the tangible tokens. They do, however, provide a sense of the significant types of interaction that the tokens afforded and supported. Overall, we found the presence and functionality of the tangible tokens a successful feature of Reminisce, and something that all the participants commented upon in very positive terms. Although our prototype installation had a short lifespan at Bunratty Folk Park, the public trial taught us some valuable lessons that may be useful to other exhibition designers and curators. First of all, mixing digital and physical components within an interactive installation is a successful strategy only when both components fit well within an overall storyline: the creation and detailing of a coherent and consistent storyline is fundamental in ensuring a positive visitor experience, and the specific components should make sense and provide continuity in the context of the story. In our case, the tangible tokens fitted well within the theme of personal histories that we applied to the design of Reminisce: the tangible objects were small domestic keepsakes that could easily be connected to the everyday lives both of the characters featuring in our installation and of actual people from times past. The participants commented on them as something that brought them back to the times when the houses were built and the traditional activities performed. Secondly, the design of the tangible artefacts needs to be place-sensitive: the material and sensory qualities of the physical components of an installation need to integrate with the lived physical setting where the artefacts will be used. In Reminisce, the tokens fitted well with the setting of Bunratty Folk Park: a collection of domestic, rustic, simple dwellings where everyday traditional activities still take place. The physical objects were easily connected with the place and its activities and helped as a way for participants to keep their focus on the setting, not on the high-tech components of Reminisce. The tokens were simple and cheap (something that is also important when designing a similar installation aimed for hundreds of participants), but their value was perceived in the context of the theme and of the place. This attention to the context needs to be kept in mind throughout the design process and integrated fully into technological development as well. Finally, the tangible tokens also contained a high-tech component and were instrumental in accessing all the features of Reminisce. This was important in making the tokens an integral part of the technical infrastructure, and in making the participants value them not just as quaint trinkets, but rather as real ‘keys’ to digital content. It is important to note, however, how the high-tech component enabled a very simple and straightforward interaction modality around the desk in the schoolhouse. Although it is technically possible to embed high-tech components into physical objects (such as sensors, circuits, etc), we found it effective to keep the technical capability of the tangible tokens limited to one functionality; their importance in bridging between the physical and the digital trail was not diminished, and the tokens did not become high-tech gimmicks in the eyes of the participants. Overall, we feel that the integration of tangible artefacts was a successful design decision for Reminisce, and a promising line of research for future hybrid installations in the context of living history sites. This research was funded by Failte Ireland and by the University of Limerick Seed Funding. The Authors wish to acknowledge the contribution and support of Shannon Heritage, of staff and visitors at Bunratty Folk Park, and of all the participants in the project activities. Special thanks go to Eamonn Finn for his support on the ground during the trial of Reminisce. Aoki, P.M., R. Grinter, A. Hurst, M.H. Szymanski, J. Thornton and A. Woodruff (2001). “Sotto voce: exploring the interplay of conversation and mobile audio spaces”. Proceedings of CHI 2001, Minneapolis. New York: ACM, 431-438. Brown, B., M. Chalmers, M. Bell, M. Hall, I. MacColl and P. Rudman (2005). “Sharing the Square: Collaborative Leisure in the City Streets”. In Proceedings of ECSCW 2005, Paris (2005), 427-447. Ciolfi, L. and M. McLoughlin (2010). “Challenges for the Technological Augmentation of Open-Air Museums: Bridging Buildings, Artefacts and Activities”. Proceedings of NODEM 2010, Nordic Digital Excellence in Museums. Copenhagen (Denmark), November 2010. Ciolfi, L., M. McLoughlin and L.J. Bannon (2008). "Lessons from a Walk in the Park: Augmenting the Visitor Experience at Heritage Sites". In McCarthy, J., I. Pitt and J. Kirakowski, (Eds. ), Proceedings of iHCI 2008. University College Cork (Ireland). Fraser, M., D. Stanton, K. Hui Ng, S. Benford., C.O’Malley, J. Bowers, G. Taxén, K. Ferris, J. Hindmarsh (2003). “Assembling History: Achieving Coherent Experiences with Diverse Technologies”. In Proc ECSCW 2003, Helsinki, Finland. Giaccardi, E. and L. Palen (2008). “The Social Production of Heritage through Cross-media Interaction: Making Place for Place-making”. International Journal of Heritage Studies, 14.3. Koleva, B., S. Rennick-Eggestone, H. Schnädelbach, K. Glover, C. Greenhalgh, T. Rodden, M. Dade-Robertson (2009). “Supporting the Creation of Hybrid Museum Experiences”. in Proceedings of CHI 2009, Boston, ACM. O'Hara, K., T. Kindberg, M. Glancy, L. Baptista, B. Sukumaran, G. Kahana and J. Rowbotham (2007). “Collecting and Sharing Location-based Content on Mobile Phones in a Zoo Visitor Experience”. Computer-Supported Cooperative Work, 16, 1-2, 11-44. Paterson, N., K. Naliuka, S.K.. Jensen, T. Carrigy, M. Haar, F. Conway (2010). “Design, implementation and evaluation of audio for a location aware augmented reality game”. In Proceedings of the 3rd International Conference on Fun and Games, Leuven (Belgium ). New York: ACM, 149-156. Pfeifer, T., P. Savage and B. Robinson (2009). “Managing the Culloden Battlefield Invisible Mobile Guidance Experience”. In MUCS '09: Proceedings of the 6th international workshop on Managing ubiquitous communications and services, Barcelona 2009. Ruhe, R. (2010). Personal Communication. Walker, K. (2008). “Structuring Visitor Participation”. In L. Tallon and K. Walker (Eds.). Digital Technologies and The Museum Experience. Plymouth: AltaMira Press, 109-124.